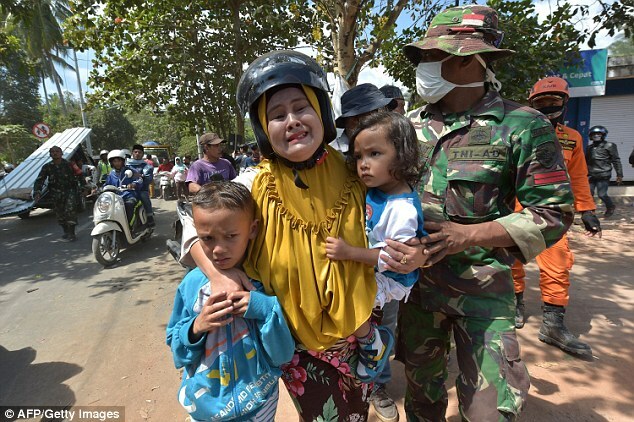 A strong aftershock has struck Indonesia's Lombok island, just four days after a devastating earthquake killed more than 345 people and left thousands homeless. The 5.9-magnitude aftershock quake struck at a shallow depth on Thursday, with its epicentre in the northwest of the island, the US Geological Survey said. 'Evacuees and people ran out of houses when they felt the strong shake of the 6.2 magnitude quake .... People are still traumatised. Some buildings were damaged further because of this quake,' Sutopo Purwo Nugroho, a spokesman for Indonesia's disaster mitigation agency (BNPB), said on Twitter.